Heat Pump Water Heaters have been on the market for several years now and although lots of different opinions exist about the technology, they are gaining lots of popularity. Videos like THIS are helping to educate the consumers and professionals alike as to why they should consider this reliable technology. In reality, this technology is nothing new. In fact, the components that make your refrigerator work are almost the exact same components that make a Heat Pump Water Heater work. Heat Pump Water Heaters are by far the most efficient way to heat water in your home and most people have no idea how they work. Lets take a quick look at how a Heat Pump Water Heater works so hard to save you money! A Heat Pump Water Heater has a fan built into the top of the unit which draws the ambient air around the water heater across the refrigerant coils of the unit. The heat that is absorbed into the refrigerant is then compressed, further raising the temperature of the refrigerant. The now hot refrigerant travels through coils around that tank of the water heater which then cools the refrigerant as it heats the water and the process then repeats. 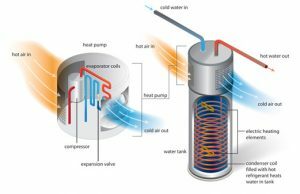 Heat Pump Water Heaters also have standard electric elements in them in the event that your recovery demand exceeds the ability of the heater, or if the ambient air around the heater drops below the efficient operating temperature which is usually around 45 F degrees. A garage is a great location for the Heat Pump Water Heater to be installed as one of its byproducts is cool, dehumidified air. When considering a Heat Pump Water Heater, it is always a good idea to consult with an experienced contractor to go over the instillation location constraints and options. Give Pacific Plumbing and Rooter a call today to discuss your options and start saving money right away! And with the credits and rebates, its never been more affordable to switch to a Heat Pump Water Heater! previous post: Leaking Water Service Line! !